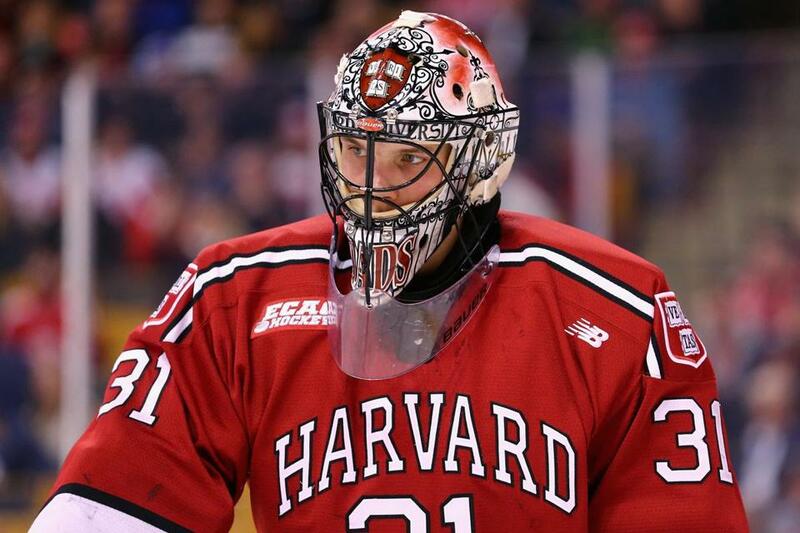 Harvard goaltender Merrick Madsen has an 18-6-3 record, a 1.96 GAA, and a .933 save percentage. Math question: How does a stringy, 6-foot-5-inch kid raised some 30 miles north of Los Angeles, content at moving at his own rate of speed, end up some 3,000 miles east in Cambridge as the No. 1 goalie in a Division 1 NCAA program playing for the most prestigious college in the country? Madsen, a 20-year-old sophomore, will be back as a towering presence in front of Harvard’s 4-by-6-foot rectangular net Friday night when the Crimson take on powerhouse Boston College (26-7-5) in the opening round of the NCAA regional playoffs. His path has been somewhat unconventional, but Madsen has been nothing if not steady, sure, and direct this season in helping Harvard to a 19-10-4 overall record and a second consecutive trip to the NCAA Tournament. Harvard and BC will square off at 8 p.m. at the DCU Center in Worcester, following the other Northeast Regional between Providence and Minnesota-Duluth (4 p.m.). In all, a total of eight New England teams, including Boston University, UMass-Lowell, Northeastern, Quinnipiac, and Yale, will be among the 16 clubs battling this weekend to get to next month’s NCAA Frozen Four in Tampa. A backup last season to Steve Michalek (since turned pro), Madsen played only two periods for the Crimson in 2014-15, then took early command of the starter’s role this season. This month, he was in net for both ECAC tourney wins over RPI, and was back in there again last weekend at Lake Placid when the Crimson rubbed out St Lawrence in the semifinals and then fell to Quinnipiac, 4-1, in the final. Here’s a game-by-game look at the first-round matchups in the NCAA hockey tournament. “A great kid with a great work ethic,’’ said Harvard coach Ted Donato, noting Madsen’s athleticism and agility, a rare blend for such a young, tall tender. “He’s improved right in front of our eyes. A math whiz at a young age, Madsen completed three years of algebra and geometry courses by his middle school years in Acton, Calif., then took advanced math classes at a local community college as part of his home schooling curriculum before moving to Proctor Academy (Andover, N.H.) at age 16. He played two seasons at Proctor, graduated in 2013, and already with a commitment to Harvard, he played a season of junior hockey prior to joining the Crimson in the fall of 2014. Madsen is one of three California-raised goalies who now play dominant roles here with local Division 1 teams. Thatcher Demko, BC’s outstanding backstop, was raised in San Diego and played against Madsen when they were 11- and 12-year-olds. Northeastern freshman Ryan Ruck, who will be in net Friday for the Huskies’ battle against North Dakota, grew up in Coto de Caza, south of Los Angeles. Like Madsen, he also played for Minot (N.D.) in the North American Hockey League — another step en route to Division 1 hockey. The other California goalie of note back in their boyhood days was Eric Comrie, who ultimately played in the Western Hockey League and has since turned pro, playing for the Winnipeg Jets affiliate in the AHL. Madsen and Demko opposed each other earlier this year in the opening round of the Beanpot, the Eagles advancing to the final with a 3-2 victory. Now they’re back at it, with the winner to face Providence or Minnesota-Duluth for a Frozen Four seed. Harvard has only one NCAA title (1989), while the Eagles are aiming for their fifth since 2001. This is the first time all four Beanpot schools have qualified for the NCAA Tournament. “I think our guys expected to make the tourney,’’ added Donato. “We’ve played BC. We know they’re a great team. But that’s what’s on the menu this time of year, right? “Look at Northeastern. 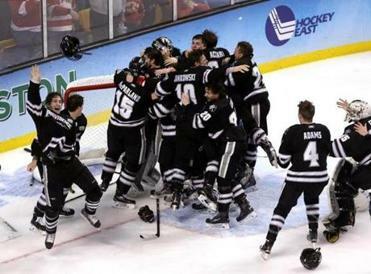 They win the Hockey East championship and now they’ve got to go up against a great North Dakota team. Madsen was drafted by the Philadelphia Flyers in 2013 and has attended three of their offseason development camps, hoping one day to challenge for a spot in their net. How soon remains a question. Asked if he planned to play through his senior season and earn his degree, Madsen said, “If you asked my mom, she would say yes. If you asked me, I would probably say the same thing. Madsen recently switched his major from applied mathematics to pure mathematics. If the co-major in goaltending doesn’t lead to full-time work, he is undecided about where the math might take him. “It’s tough. As much I do enjoy math, it’s hard to picture what you might do with it. You aren’t going to get a job based on how well you can do a proof. It’s the playoffs. Four more wins would bring the Crimson a national title. For the moment, it’s the only math that counts. Kevin Paul Dupont can be reached at kevin.dupont@globe.com. Follow him on Twitter @GlobeKPD.